Støvkornenes dans i solstrålerne (Dust Motes Dancing in Sunbeams), also Solstråler (Sunbeams), is an oil painting from 1900 by the Danish Symbolist painter Vilhelm Hammershøi. Considered to be one of the masterpieces of Danish culture, it was included in the 2006 Danish Culture Canon. 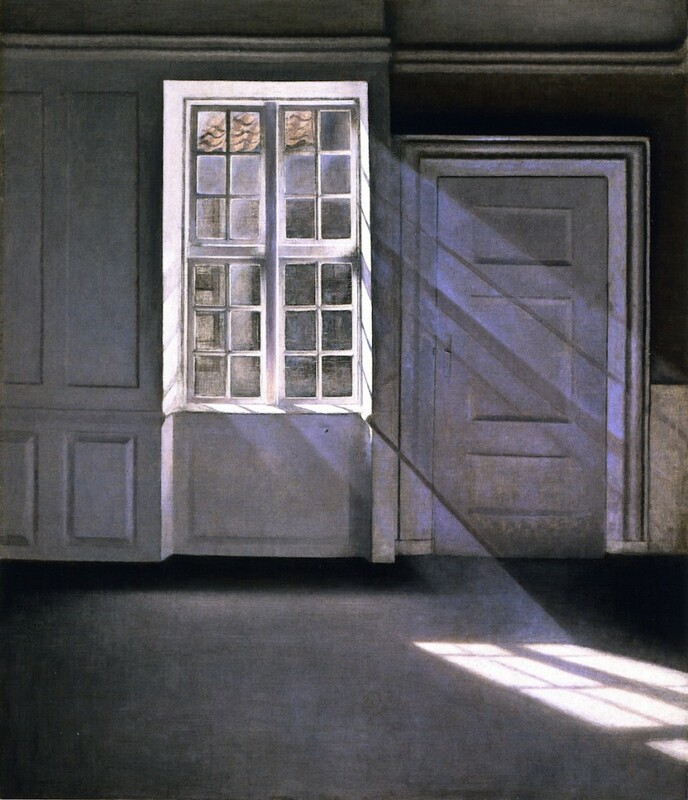 The painting (oil on canvas, 70 x 59 cm) presents an empty room in Hammershøi’s 17th century apartment in the Christianshavn district of Copenhagen. The bare pannelled walls, without any furnishings or decorations, are illuminated by rays of winter sunlight shining through the window, a pattern of light and shade falling on the wooden floor. The central feature of the work is the recessed window, through which shafts of dust-filled light shine diagonally down into the greyness of the room. The lack of colour is typical of Hammerhøi. The overall impression is that the painting portrays a dark, slient psychological space although in fact the room was located in a busy part of the city, close to the noise of docks and factories. Like many of his contemporaries, Hammershøi used photography as a basis for his works. This is also the case here. Indeed, the painting conveys the impression of a black and while photograph with all the intermediate greys while the dusty rays of sunlight give the room a highly poetic look. 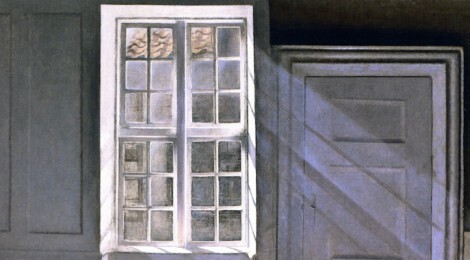 As in the paintings of the Romantic period, the window can be seen as a symbol of longing and dreaming, connecting the room’s interior with the world outside, juxtaposing near and far.